Préparez-vous à siroter, goûter et savourer avec un vin et dîner dans la région viticole uruguayenne. Partez en excursion en petit groupe depuis votre hôtel de Montevideo vers un vignoble familial primé spécialisé dans le Tannat, un vin rouge audacieux, en plus d'autres cépages. Visitez la propriété et apprenez-en plus sur leur processus, puis profitez d'une dégustation de cinq vins différents accompagnés de collations légères. Asseyez-vous et dégustez un déjeuner à 3 plats, composé d'empanadas, avec des accords vino spécialement choisis. Apprenez-en davantage sur l'histoire de la vinification en Uruguay en mangeant et en buvant. A wonderful experience with Ryan Hamilton. Very knowledgeable. A great visit and tasting at the Carrau vineyard hosted by the owner himself. Excellent sampling of five of their products, and a chance to buy a couple of our favourites. Lunch was great fun, prepared by one of Montevideo's premier chefs, and accompanied by a couple of Ryan's favourite wines. Can't recommend this one highly enough! The tour guide was very well informed and it was great to meet one of the owners of the vineyard. Lunch at the restaurant Il Forno was amazing! Ryan is a fantastic tour guide. I wish I had him for more tours but sadly not enough time. 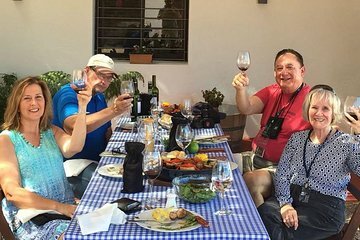 I highly recommend this tour to those who love wine , food, and learning a bit about the process of wine making. Our knowledgeable English speaking guide (and driver),Ryan, picked 4 of us up for our tour. He was entertaining and informative on the drive to the winery (which wasn't too far out of town). The winery we visited (Bodega Carreou) had a 10th generation member of the wine making family give us the tour, which included a chance to see wine being bottled and labled. After a short tour of the facilities we went to a cozy tasing room. We were offered a wide array of wines, from the starter series to the premium line, including some older vintages. There was no shortage of wine to be drunk. After we had our fill, Ryan drove us back to town to a special restaurant for a special lunch, with a special wine that Ryan brought to accompany the meal. I was fearful the meal would be something typical and unmemorable. I shouldn't have worried-the meal was the best we had during our 14 day South American trip and the wine was great!. It was obvious the chef took pride in his craft and rightfully so. This wine tour was well worth what we paid and I recommend Ryan without hesitation!! Worth every penny, fantastic tour! This was the best ! Lunch included was great, the Winery visit was really worth it The Wine Experience totally worth it.